Composting Leaves - How To Make Incredible Compost From Leaves! Autumn has arrived, and that means it’s time to start composting leaves! Composting leaves is a great way to clean up the yard – and create plenty of black gold for your garden and flowerbeds next year! When it comes to recharging and building soil naturally, compost is king. Working in large amounts of compost to your flowerbeds and garden keeps soil fertile and productive. Composting leaves is a great way to create great soil from Autumn’s beauty. It is why so many gardeners refer to compost as black gold. It simply is that valuable! And fall’s overflowing bounty of falling leaves are the perfect ingredient for creating a great compost pile to create plenty of black gold. When it comes to composting leaves, following a few simple guidelines will go a long way towards creating a compost pile that decomposes quickly, and is filled with the right blend of nutrients. In most cases, a well-made pile this fall will be ready for use in the garden by late next spring. Although nearly all leaves can be composted, there are some varieties that are harder to compost than others. Leaves from trees that produce waxy leaves or needles, such as magnolia and pine trees, are among the hardest to compost. Their protective coating can take years to break down. These leaves are great for using as a mulch, but are best left out of the compost pile. Especially if you are looking to have a pile ready to use next spring or summer. So what are the best leaves to use? Fruit trees, maple trees, and other soft-leaf producing trees such as ash, birch and beech top the list. The leaves from these trees break down quickly in a compost pile. At the same time, they provide a good balance of nutrients to the pile. Oak leaves can be use for composting too, but due to their acidity, should never make up more than a third of the pile. Creating The Pile – Shred Those Leaves! If you want to make compost fast with leaves – you need to shred them. It speeds up the decomposition process immensely – and saves on space! Shredding leaves before adding them to the pile is a must! Whole leaves can take years to break down, and create a wet, moldy and unsightly compost pile. Shred leaves into fine pieces with either a leaf shredder or a lawn mower. A bagging attachment on a push mower will make quick work of the shredding process. 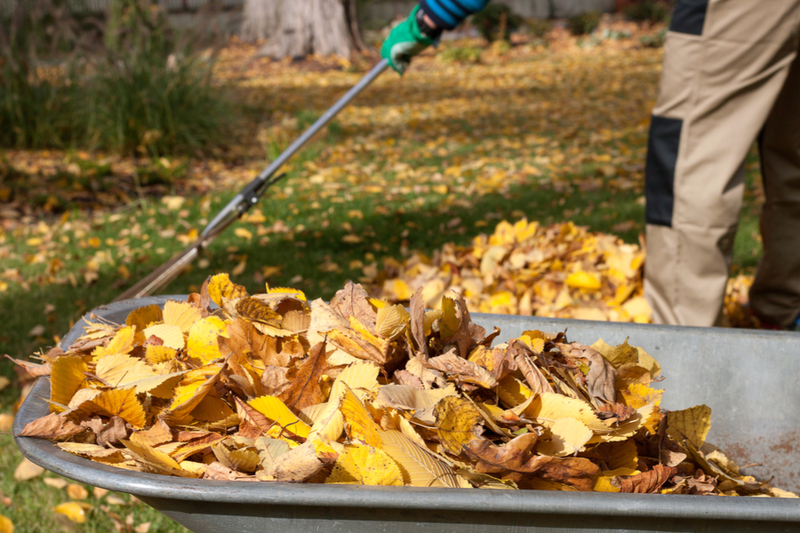 Although large piles of shredded leaves will decompose slowly over time by themselves, by adding additional “hot ingredients” to your pile, you can speed up the process and create your own version of black gold. A great compost pile is made up of a blend of dry and green materials. The shredded leaves (a dry material), need to be blended with enough green to activate the pile. Green materials are the main source of nitrogen to the pile. And nitrogen is the crucial element needed to start the process of rapid decomposition. A good rule of thumb for a fast-acting pile is to add one part green for every four parts dry. In simple terms, that means if you add in four large bags of shredded leaves, add in the equivalent of a large bag of green material. All of these materials can be added to your shredded leaf pile to create the perfect fall compost pile. Composting Leaves – Don’t Forget To Turn And Water That Pile! Once created, a compost pile needs oxygen and water to thrive. And the only way to provide it is by turning and watering the pile as needed on a regular basis. Compost piles need to be turned a few times each week for maximum success. This process brings oxygen back into the center of the pile, and keeps the decomposition process going strong. Fall’s leaves are more than just beautiful – they are perfect for making compost! Like oxygen, a compost piles needs moisture to stay active as well. A working compost pile should be moist, but not saturated. If your pile begins to dry out in the center, add water when turning to help keep it active. This Is My Garden is a gardening website created by gardeners, for gardeners! We publish two garden articles every week, 52 weeks a year. Sign up below to follow along via email, and be sure to follow us on Facebook @ TIMG as well. You can also share your backyard gardening tips or stories with us at info@thisismygarden.com to be our next feature! This article may contain affiliate links. Growing Container Tomatoes – 3 Great Varieties To Try On Your Patio!